My first taste of a bottle hopped beer. Overall verdict: acceptably tasty but certainly the wrong hop. Appearance - Foam starts climbing up the neck of the bottle within a few seconds of popping the cap, luckily I was ready to pour and didn't loose a drop. 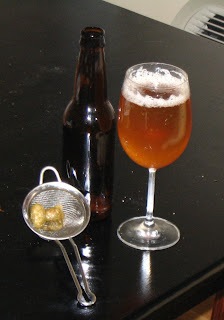 Most of the hops jammed in the neck of the bottle and never made it to the tea strainer, but it did serve to catch a few petals. Once it arrives in the glass the beer is a hazy orange with a coarse head that falls quickly. Smell - Fruity hops on top of slightly funky Brett. The hop aroma is a bit aggressive and sharp, with a slightly funky oxidized edge (but that may be the Brett playing tricks on me. Taste - Lightly tart with big Brett funkiness. However the American citrusy/piney hops do not mesh well with the flavor. The beer isn't bitter or sweet, pretty well balanced. Mouthfeel - The foaming knocked out some of the carbonation, but it still has plenty to fill out the medium-light body. Drinkability/Notes - Not bad, but I'm glad that I only added Simcoe to one bottle. I am looking forward to seeing how the other hops, particularly the less aggressive European decedents, taste. 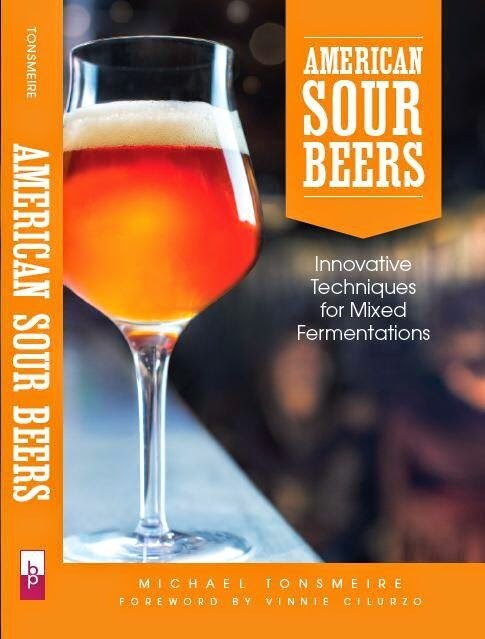 I'll be interested to hear how the other bottle-hopped sour beers turn out. New Belgium used Cascade and Amarillo in Le Terroir with a fair amount of success and Cantillon has used both of those hops in their dry-hopping experiments. P.S. Great blog! I love the technical approach and the wild/sour focus. Cheers!! I have a Flanders Red going that I was thinking of splitting and stealing the Le Terroir dry hopping idea for, but after this I think I may not go with the American hops. I have 6 gallons, 2 will be plain and 2 will be aged with sour cherries, just trying to figure out what to do with the last 2 gallons.